Salt Lake City, Utah Feb. 15, 2019 — Nightingale College, a fully accredited nursing school, announced today its upcoming networking events to be held at partner facilities throughout Utah, Idaho and Wyoming. These networking events provide an opportunity for prospective and current nursing learners and alumni to cultivate relationships with health care professionals in their community. Representatives from health care facilities are also invited to explore partnership opportunities for expanding accessibility to nursing education. February 19, 2019 from 8 a.m. to 10 a.m.
February 20, 2019 from 8 a.m. to 10 a.m.
February 21, 2019 from 8 a.m. to 10 a.m.
February 23, 2019 from 8 a.m. to 10 a.m. Many of these partner facilities also houses the College’s DDC area hub where learners gain hands-on nursing skills. Partners and health care facilities interested in joining the consortium to provide experiential learning are welcome to tour the hub and meet Nightingale staff and faculty to learn about the College’s unique education model. This hybrid-virtual model allows learners to take didactic courses online and complete experiential learning requirements at local health care partner facilities such as hospitals and long-term care facilities, as well as the local experiential learning hub. The College offers two programs with this model, the ADN Program, which can be completed in as few as 20 months, and the 32-month BDN Program. For additional information about the networking event, please email careerservices@nightingale.edu. This is a free event that is open to all. No reservation required. Nightingale College creates avenues to accessible nursing programs with its fully accredited distance education associate and bachelor’s degree nursing programs. Supporting the growing need for nurses and providing strategies to combat the nursing shortage, the College’s programs work to not only grow but maintain homegrown nurses with the help of local health care systems. Nightingale College emphasizes graduating future nurses who are confident, competent and compassionate. Since its establishment in 2010 in Ogden, Utah, the College has graduated nurses in Utah, Idaho, and Wyoming. To learn more about the College, its mission, and programs, visit http://nightingale.edu/. With 63 graduates in blue and 6 in black, the room pulsed with excitement and anticipation. Waiting for the event to start, the graduates exchanged excited whispers and laughter to pass time between rehearsal and the event. The room quickly became full of cheers and hollars as family and friends watched their graduate descend the stairs and into their seat during the processional and did not cease until well after the ceremony had ended. 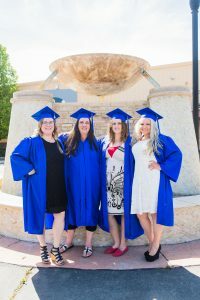 This graduation marks a few milestones for the College: Six learners from the RN-to-BSN Program graduated this semester, which is a new record, and this was also the very first graduation from the Evanston, Wyoming DDC (see all of our locations here). Congratulations to the ADN and BSN Degree Programs’ graduates! To view photos of the event, visit our Facebook page. The valedictorian from both programs followed Larsen’s remarks. Dionne Jaques, valedictorian of our RN-to-BSN Program, spoke on overcoming fear. “All of us started out nervous, scared, unsure of ourselves, unsure of how to combine school with our lives,” she said. 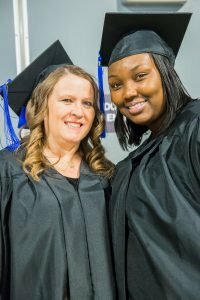 “But we learned to take that fear and stomp on it, and say ‘We can do it!’” Read more about Jaques’ unique journey through nursing school here. 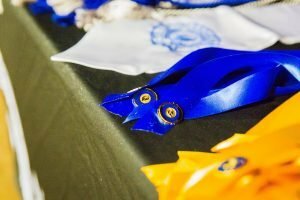 After being inspired by their valedictorians, graduates were inspired anew by their classmates who received honors and awards. 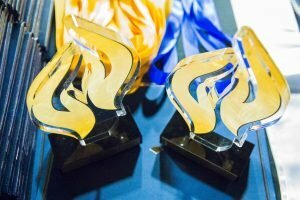 There are several different awards given away at graduation, including the FLAME! FORWARD! Award, the Community Fellow Award, and the academic honors. Dionne Jaques and Megan Trappen received the Community Fellow Award for their dedication and service as volunteers. The FLAME! FORWARD! Award is given to learners who have gone above and beyond our expectations. Faculty members nominate students for the FLAME! FORWARD! Award when they feel a learner exemplifies all the seven values of the college. Jonathan Loper and Stephanie Atkinson were presented with the FLAME! FORWARD! Award this year. 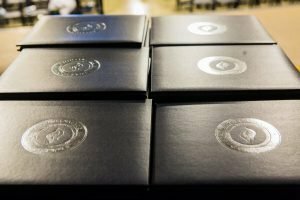 Next on the list, the graduates received their nursing pins from those individuals who had a profound effect on their nursing journey, usually a family member, spouse, or instructor. Then with cheers from the crowd, each graduate walks across the stage to receive their degree. Kara McDonald-Harmon, Vice President of Operations and Controller at the College, conferred the degrees at graduation. 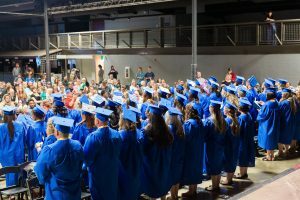 Bursting with excitement, graduates cheered as they moved their tassels. What an accomplishment! We are so proud of all these learners who have studied countless hours, sacrificed precious sleep, and dedicated so much of their time and energy to becoming nurses. We know you will be incredible in this noble profession. The graduates of the ADN Program will now work toward passing the NCLEX-RN and becoming licensed as registered nurses. The faculty and staff at Nightingale wish the graduates the utmost success in their future nursing careers. May the light of Florence Nightingale’s lamp and her unwavering values light your path onwards to great things, and remember, be willing to dare greatly! If you are interested in having your unique journey through nursing school featured in an in-depth article, please submit this form.